The Castlemaine area was sparsely populated until the discovery of gold in the Mount Alexander/Forest Creek area in September 1851. The rapid growth in population demanded some measure of government control. An official Camp Reserve was set up in 1852 and a survey for the town of Castlemaine followed soon after. The easily accessible gold deposits were soon exhausted but the town had by this time become sufficiently diversified to ensure continued existence. The establishment of such industries as the Castlemaine Brewery, the Castlemaine Woollen Mills and Thompson's Foundry from the late 1850s were major sources of employment in Castlemaine and the town continued to prosper. The Imperial Hotel [also known as the Town Hall Hotel, and later Beck's Richmond Hotel and Beck's Imperial Hotel] was built in 1861.The two storey hotel with attic was erected for Faulder Watson to the design of Melbourne architects Purchas and Swyer. Watson became the first licensee on 21 Dec 1861. Watson retained the licence until about 1866 when the hotel was advertised as [William] Young's Imperial Hotel. Watson apparently retained the ownership of the hotel until c1885 when he sold it to slaughterman Edwin Purches who is recorded as having offices in the premises. By 1887, the hotel was owned by Mrs E Pearson who held the property until at least 1903. In 1892 during Mrs Pearson's ownership, the extant cast iron verandah and balcony to the Lyttleton St facade was constructed in place of the original first floor cantilevered balcony. In the early years of the twentieth century, the hotel had numerous publicans until about 1931 when R W S Beck acquired the hotel licence. The name Beck's Imperial Hotel reflects Reg Beck's long-term ownership of the hotel between about 1931 and 1942. The hotel licence was surrendered in 1968 and in the following year, C S Harrison purchased the property and re-opened the building as tea rooms and a tourist accommodation centre. The Imperial Hotel is a two storey stuccoed building with an attic storey with iron cresting and dormer windows. The Lyttleton St elevation has a two storey cast iron verandah and balcony which was added in c1892 following the removal of the original cantilevered balcony. The exterior walls, dormer windows and the corner chimneys are elaborately and distinctively detailed. 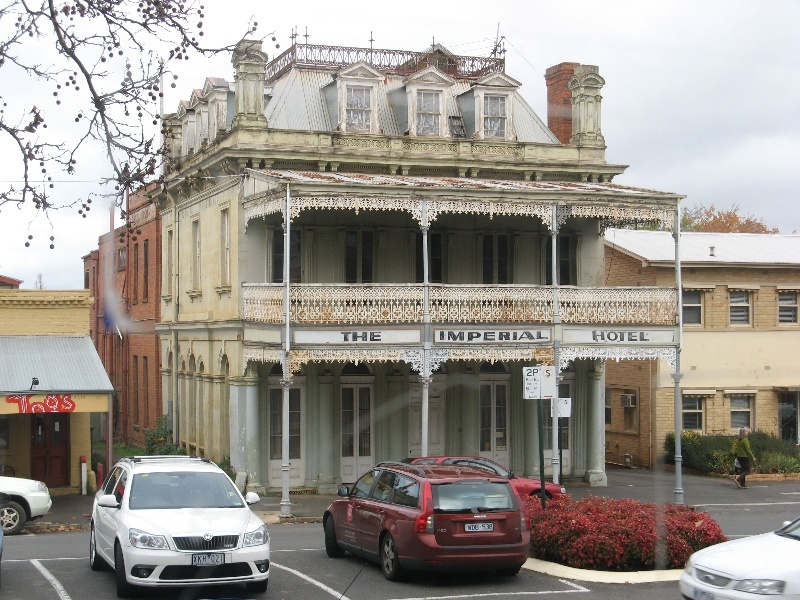 The Imperial Hotel is of architectural and historical significance to the State of Victoria. The Imperial Hotel has architectural significance as one of the most innovative classical revival buildings in Victoria. The French Renaissance influence on the design is particularly notable for a building of the early 1860s. The building is distinguished by its iron crested attic storey, the elaborate detailing of both the corner chimneys and dormer windows to the Lyttleton Street and side elevations. The design is an important example of the work of architects Purchas and Swyer who also designed the significant Glenara homestead at Bulla [VHR H0625]. 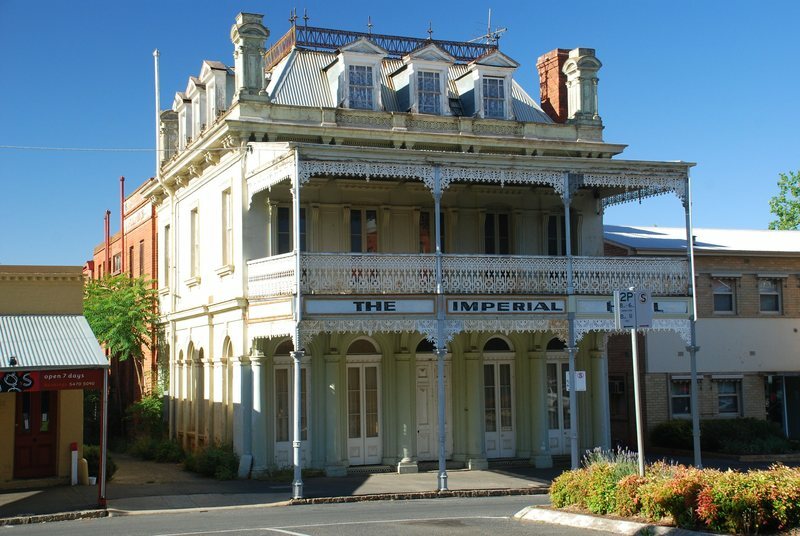 The Imperial Hotel is of historical significance as one of the most distinctive hotel buildings in Victoria and the sophistication of design from a leading firm of Melbourne architects is a reflection of the confidence shown in the development of Castlemaine as a significant post-gold rush regional town. The hotel is a critical element in an important historic townscape. City of Castlemaine. No. 132. 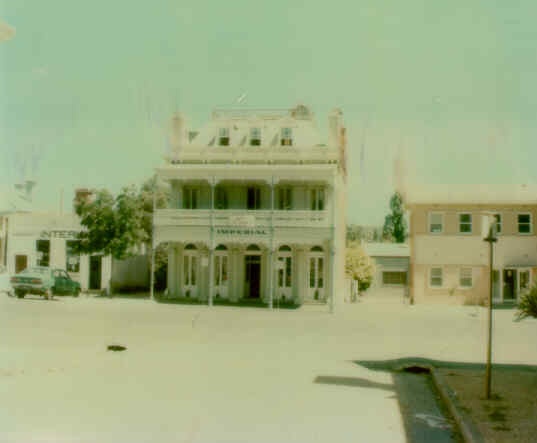 Former Imperial Hotel, 56 Lyttleton Street, Castlemaine. The Castlemaine area was sparsely populated until the discovery of gold in the Mount Alexander/Forest Creek area in September 1851. The rapid growth in population demanded some measure of government control. An official Camp Reserve was set up in 1852 and a survey for the town of Castlemaine followed soon after. The easily accessible gold deposits were soon exhausted but the town had by this time become sufficiently diversified to ensure continued existence. The establishment of such industries as the Castlemaine Brewery, the Castlemaine Woollen Mills and Thompson’s Foundry from the late 1850s were major sources of employment in Castlemaine and the town continued to prosper. The Imperial Hotel [also known as the Town Hall Hotel, and later Beck’s Richmond Hotel and Beck’s Imperial Hotel] was built in 1861.The two storey hotel with attic was erected for Faulder Watson to the design of Melbourne architects Purchas and Swyer. Watson became the first licensee on 21 Dec 1861. Watson retained the licence until about 1866 when the hotel was advertised as [William] Young’s Imperial Hotel. Watson apparently retained the ownership of the hotel until c1885 when he sold it to slaughterman Edwin Purches who is recorded as having offices in the premises. By 1887, the hotel was owned by Mrs E Pearson who held the property until at least 1903. In 1892 during Mrs Pearson’s ownership, the extant cast iron verandah and balcony to the Lyttleton St facade was constructed in place of the original first floor cantilevered balcony. In the early years of the twentieth century, the hotel had numerous publicans until about 1931 when R W S Beck acquired the hotel licence. The name Beck’s Imperial Hotel reflects Reg Beck’s long-term ownership of the hotel between about 1931 and 1942. The hotel licence was surrendered in 1968 and in the following year, C S Harrison purchased the property and re-opened the building as tea rooms and a tourist accommodation centre. Perrott Lyon Mathieson P/L. City of Castlemaine Architectural and Historical Survey 1979.